Malware can infect your computer without warning and often at the most inopportune times. There are even instances where some of the industries best anti-virus software like Norton 360 and McAfee 2011 fail to stop malware from infecting your computer. 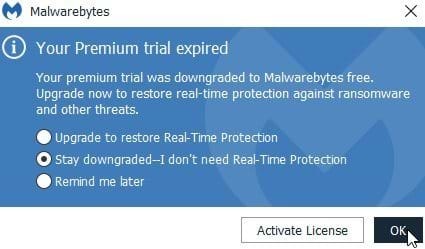 Fortunately for you (and us), the makers of Malwarebytes Anti-Malware/spyware software entered the scene a few years ago and completely changed how, and more importantly – how effective, people can identify and remove threats that would otherwise affect their computer’s performance…sometimes leaving it entirely useless. What’s the difference between Malware, Spyware, and Viruses? Computer Viruses: A computer virus is a program that has the ability to infect a computer and copy itself. Viruses can spread from computer to computer by way of a computer network or by removable media such as a flash drive, CD, or DVD. It’s important to note that the term “virus” is commonly used to refer to other types of malware such as adware and spyware programs – the reference is incorrect. Adware and spyware programs do not replicate and therefore do not fall under the virus category. Malware: Malware, short for malicious software, is software designed to access a system without the knowledge of the owner or administrators. Malware has the single purpose of causing harm to one’s computer – either by damaging hardware (which is rare) or by affecting the performance of a system. Malware includes viruses, trojans, worms, spyware, scareware, and other unwanted and damaging software programs. In terms of the four types of malware, the term “malware” encompasses them all. Spyware: Spyware is software that is used to monitor the activities of a computer. Where you browse, your preferences, what you buy, how long you’re active…the list goes on. The most threatening feature (and also one of the most common uses) is keylogging. A keylogger program can log your keystroke which can result in compromised passwords and hacked accounts. Adware: Adware is any software that automatically displays, plays or downloads advertisements to a persons computer. Often in the form of popups, the object of the Adware is to generate revenue for the author or marketer. Although not all spyware is bad, some have been know to carry spyware in the form of keyloggers and other privacy-invasive software. Malwarebytes is available in two flavors: paid and free. In terms of removing malware – the free version is just as effective as the paid version. The benefit of the paid version is it’s proactive approach by providing realtime protection, scheduled scanning, and scheduled updating. The paid version is extremely affordable at only $24.95 and worth the expense. It’s better to prevent an intrusion than remove one – everytime!